CLEMSON — More Southeastern peaches will be grown organically thanks to a $1 million federal grant awarded to Clemson University. 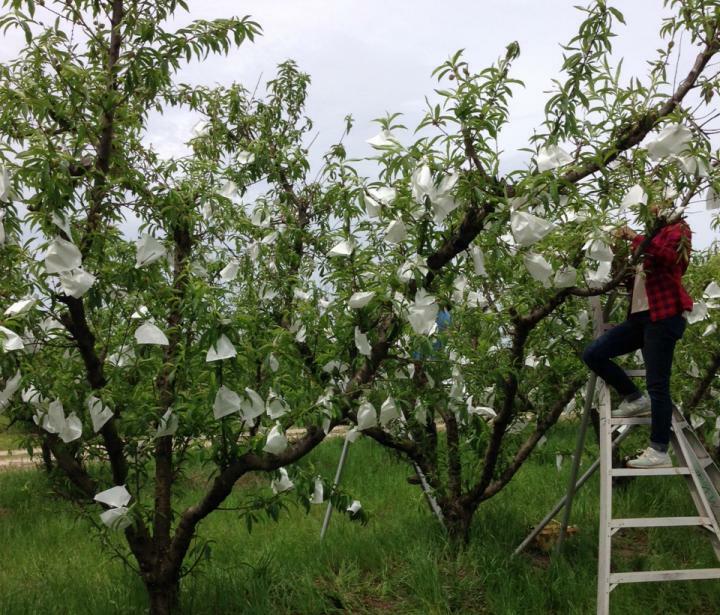 Clemson University pomologist Juan Carlos Melgar and pathologist Guido Schnabel are tying paper bags on peaches as they grow on trees, an unconventional method of protecting them from insects and disease while reducing reliance on pesticides. They began testing the method two years ago and will expand their research to more orchards in South Carolina, Georgia and Florida with a $999,770, four-year grant awarded by the U.S. Department of Agriculture's National Institute of Food and Agriculture (NIFA). They will analyze optimal bagging times, harvesting strategies and the impact of variable weather conditions. Melgar and Schnabel will collaborate with Clemson Extension agribusiness specialist Nathan Smith, along with scientists at the University of Florida and the University of Georgia, to evaluate production using bags, educate growers throughout the Southeast about growing peaches organically with this method and analyze the economics of bagged peaches. Additional labor could increase production costs, but preliminary studies indicate consumers would pay a premium for organic peaches and growers would yield a larger number of marketable fruit because pest and disease pressures are reduced. Additionally, bagging peaches may limit skin disorders caused by pesticide residue, acid rain or heat stress. This would reduce post-harvest waste and increase growers' numbers of marketable peaches. "There is great demand among consumers for organic peaches, but the production of organic peaches is concentrated in western states, such as California and Washington," Melgar said. "The production of organic peaches is extremely difficult under the humid conditions of the southeastern U.S due to high pest and disease pressure and the lack of effective, organically approved pesticides. This project will provide organic peach growers and growers in transition to organics in the southeastern U.S. with an innovative strategy to increase peach orchard productivity and economic returns; to produce high-quality, low-residue peaches; and to reduce reliance on insecticide/fungicide applications." Initial tests on bagged peaches show sugar and acidic content, and the ratio between the two, to be the same in both bagged peaches and peaches applied with pesticides, so flavor is not affected. Fruit size and weight were also the same, Melgar said. For some varieties tested, the only difference was the color. Some bagged peaches are not as blush red as conventionally grown peaches because they do not receive as much sunlight. "America's organic industry continues to grow and is an increasingly viable option for farmers and ranchers," NIFA Director Sonny Ramaswamy said in announcing more than $21 million grants to support organic research, including the grant to Clemson. "USDA supports research, education and extension to give organic producers science-based best-practices, helping them grow their business by contributing to a healthy America." South Carolina growers harvest more than $64 million in peaches a year, according to figures from the National Agricultural Statistics Service. That puts South Carolina second only to California in peach production, and the Southeast as a whole produces nearly one third of the peach crop grown in the United States.